I've had a few people after me for a while about hiding my talents. That's totally not what I've been doing. I just DON'T like being in front of a lot of people. Call it performance anxiety or whatever you like but I'm not hiding. In December, my friend, who happens to be the choir director at church, asked Mickey and I to sing a solo/duet part of a song. I agreed. Then I freaked. She's one of a few people who I can't say no to. (Don't abuse that now that you know, K.) I somehow made it through that frightening ordeal. That gave me a little more courage to do something again. In Relief Society, the woman's class at church, they have time for a practice song. The music director and pianist thought it would be nice to have the ladies take turns and do musical presentations. I had been thinking about it for a while but couldn't quiet get myself to sign up. I got the nerve after the director had her 18 year old sister come in a play a song on the piano. I thought if she can do it so can I. Today was the day. I was very nervous. My heart rate about probably twice as fast as normal. Somehow my hands were not very shaky and I made it through the song. I did hesitate in one spot and played a wrong note once. Hopefully not many people noticed. I was so happy to be finished and proud of myself for playing. 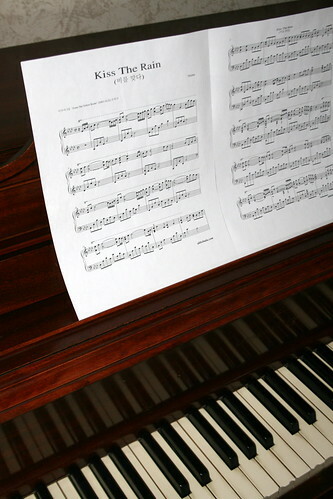 I played one of my favorite songs by Yiruma, "Kiss the Rain". The funny thing is that the weather cooperated with light rain. The performance made a few people tear up. I'll take that as a good thing. Here's a video of the song if you'd like to listen to it. It's not me. Way to go! I'd be a LOT more stressed to be in charge of an Enrichment meeting for 80 women, but that's obviously not so bad for you! Yes, I'd much rather plan an activity for 80 women. I'd be planning and organizing, things I love to do, and I'd be behind the scene where I'm more comfortable.